Three young women went out hiking in the mountains of Arizona at the Dreamy Draw Mountain in Phoenix and enjoyed much more than the stunning scenery. They had a spiritual experience. Allisa Miller, Kassi Sanchez and Jen Vickman took time off from college studies to take a relaxing break in the mountains but little did they know they would have a miraculous encounter during their hike. The friends said that the day had not got off to the best start and they were unsure whether they should go out into the mountains hiking that day. However, something compelled them to make the climb, so they set out. 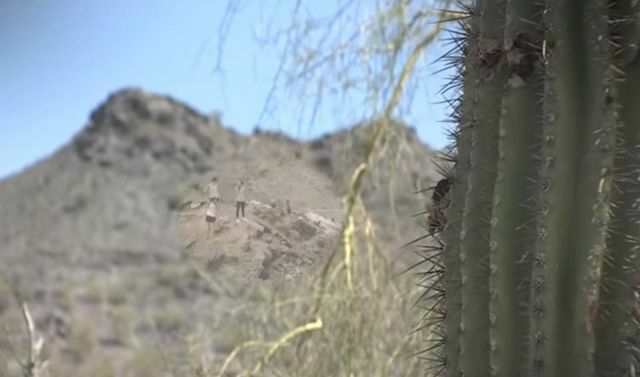 At first, the three young women joked that the figure looked like Jesus, but to their surprise just moments later the figure just vanished from the top of the mountain. The women climbed the rest of the way to the top where the figure had been standing, and this is when things got even stranger. The figure left a note with a surprise. The three friends claimed to have found an envelope lying down on the rocks. On it was written: “Do you believe in angels?” reports disclosetv.